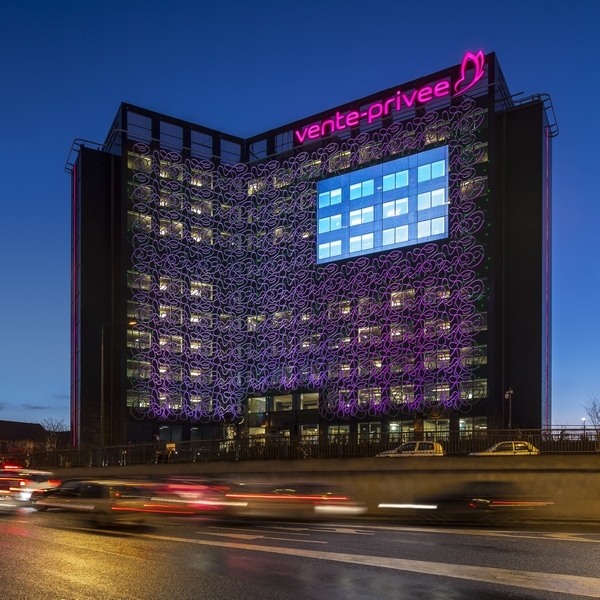 Philips Lighting, a Royal Philips company and global leader in lighting, has illuminated the most recent addition of Paris’ world famous skyline, the façade of the ‘Le Vérone’ building, the headquarters of the vente-privée e-commerce company in Saint-Denis, Paris, France. Facing the Stade de France, the new building – Le Vérone –is an office block with a difference where art meets digital on the banks of the river Seine. The architectural creation was designed by Pucci de Rossi, a renowned Italian artist and designer, and draws attention thanks to its intricate mesh façade that is covered with 1,950 LED light points. The concrete mesh sculpture has been positioned at a distance of 1 meter from the façade of the building. To create an impression of a “galaxy of lights”, the custom-made façade mesh modules incorporate 1,950 LED light points using iColor Flex LMX gen2 from Philips Color Kinetics. The flexible form factor of iColor Flex LMX gen2 allowed de Rossi enhance the perception of depth and three-dimensionality by mounting the light points both facing out, and toward the glass windows to create reflections. The façade mesh intricacy is further enhanced by additional layer of light washing the entire structure with ColorReach Compact Powercore from Philips Color Kinetics. The dynamic lighting harmonizes with the images on a high resolution screen and can be programmed to change color and intensity for many effects, including vente-privée’s signature color pink. The light points are small in size and unobtrusive during daytime in order not to affect the appearance of this work of art but bright enough at night to create a strikingly lit façade that can be seen from a long distance. 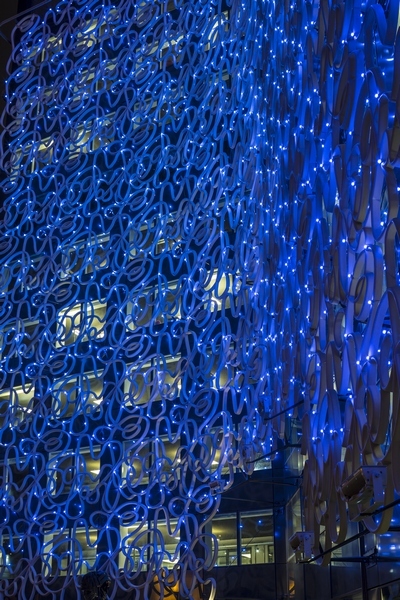 The façade of the ‘Le Vérone’ building is covered with LED lighting installations resembling a net of LEDs. “Art needs to be at the center of the suburbs, where open spaces allow exposure to monumental pieces for all to see. Le Vérone, with its mesh façade which represents the calligraphy initials of vente-privée, VP.com, is the incarnation of this wish. 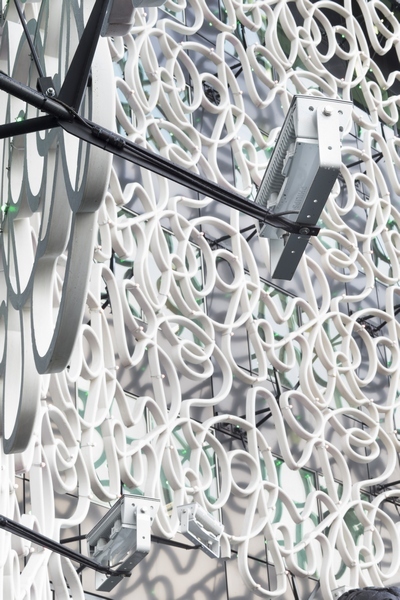 The projections on its high-resolution screen, and the animation of the LEDs of this concrete mesh façade, will be seen daily by many residents and drivers on the main road leading to the Charles de Gaulle airport,” explains Jacques-Antoine Granjon, CEO and founder of vente-privée. “Vente-privée wanted to be able to customize the lighting to specific events and so we programmed a set of sequences which may be easily modified at any time by the technicians at vente-privée,” explained Richard Brousse, Application Specialist at Philips Lighting. 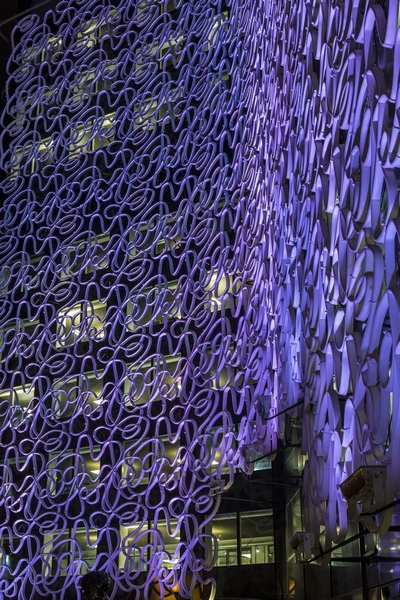 The façade of the ‘Le Vérone’ building is covered with LED lighting installations resembling a net of purple LEDs. With its Pucci de Rossi masterpiece and the exciting and spectacular lighting design created and implemented by Philips Lighting, Le Vérone has become the first private building in France to fuse connected lighting with architecture and art. Le Vérone building was designed by Italian artist and designer Pucci de Rossi and has been named after the Italian city of Verona, where Pucci De Rossi was born. The artist put the final touches to the decoration of the façade not long before his death, at the request of his friend, Jacques-Antoine Granjon, CEO and founder of vente-privée. The building was renovated by architect Jean-Michel Wilmotte and the façade is illuminated by 1,950 individually controlled RGB LED nodes of iColor Flex LMX gen2 from Philips Color Kinetics. Each iColor Flex LMX gen2 string is made up of 50 individually controllable dynamic LED nodes. The installations and LED lights turned off during the day.